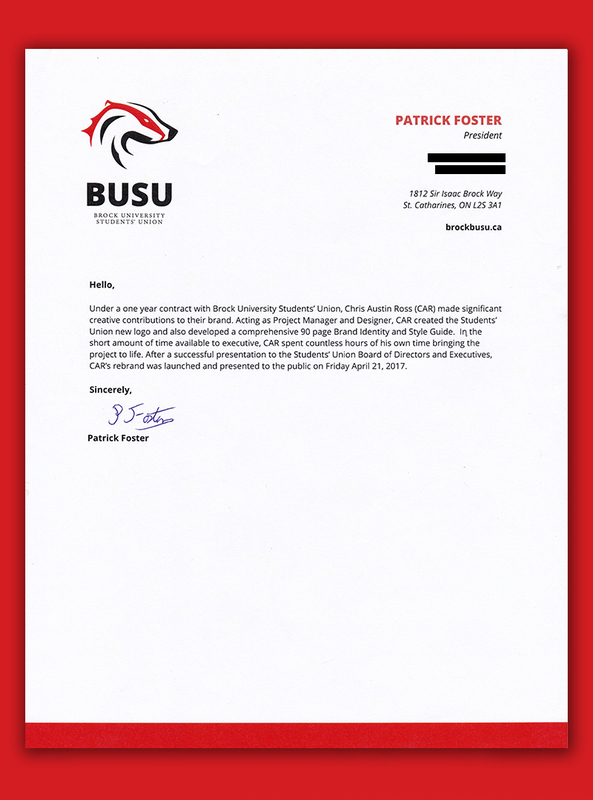 “Under a one year contract with Brock University Students’ Union, Chris Austin Ross (CAR) made significant creative contributions to their brand. Acting as Project Manager and Designer, CAR created the Students’ Union new logo and also developed a comprehensive 90 page Brand Identity Policy and Style Guide. In the short amount of time available to executive, CAR spent countless hours of his own time bringing the project to life. After a successful presentation to the Students’ Union Board of Directors and Executives, CAR’s rebrand was launched and presented to the public on Friday April 21, 2017. “ – Patrick Foster (President).